Designed to impress, the Motorola Moto G6 Plus is wrapped in scratch-resistant Corning® Gorilla® Glass with a 3D contoured back for a comfortable grip. The device is protected from slashes and light rain thanks to the p2i-rated water-repellent coating, whilst a set of on-screen navigation keys, doubles as a Multi-function fingerprint reader and face unlock to keep your data safe on the go. Featuring 12 MP & 5 MP dual rear cameras that focus fast for clear shots anytime, you’ll always get your shot. The Moto G6 Plus also features Motorola’s new smart camera system with face-unlock and landmark recognition, so it can do way more than just shoot great pics. Capture the perfect selfie on the 8MP front camera. Enjoy unlimited high quality storage with Google photos and advanced imaging software that lets you capture beautiful depth and clarity. Enjoy a breathtaking viewing experience on the 5.9" Full HD+ Max Vision display. The screen is more immersive than ever, thanks to a wider 18:9 aspect ratio and is protected on the go with Corning™ Gorilla™ Glass 3. Dolby Audio Front port loud speaker, with integrated Dolby Audio™ preset modes ensures your music is always sounding its best. 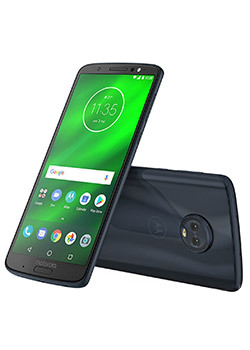 Engineered for your life, the Motorola Moto G6 Plus is built to help you access features and content quickly, easily, and securely, so you can have more peace of mind. A turbo 3200 mAh battery with the included turbopower™ charger is designed to last all day. A Qualcomm® Snapdragon 2.2 GHz octa-core processor powers impressive graphics capabilities and 4G speed, you don’t have to sacrifice video quality for a faster load time.